Let's talk about some exciting tech. And as usual, it seems to be happening far, far away from our planet earth. Yes you guessed right, we are talking about Space. This time Europe and Japan have decided to come together to form BepiColombo. So what is BepiColombo? Well it is a planned European-Japanese mission to Mercury. It is set to launch in October, 2018. The mission includes a carrier spacecraft called the Mercury Transfer Module (MTM) which supplies electrical power during interplanetary cruise and two separate orbiters. 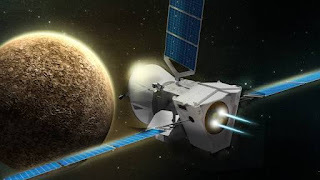 The European Space Agency's spacecraft is the Mercury Planet Orbiter (MPO) and the Japanese Aerospace Exploration Agency's spacecraft is the Mercury Magnetospheric Orbiter (MMO). Unsurprisingly, The spacecraft will take about seven years to get to Mercury, using several gravity assists from other planets along the way. It will fly by Earth and Venus in 2020, Venus in 2021 and Mercury itself between 2021 and 2025. These flybys will slow down the spacecraft enough to be captured by Mercury's gravity in December 2025. Thus it is definitely not a small journey. For the workings of the spacecraft, Japan's MMO will be dormant during the interplanetary cruise, with occasional startups to make sure that the spacecraft is operating properly. Europe's MPO will communicate with Earth and also command the Japanese spacecraft and the MTM until the three components are separated. Then, The MTM will separate from the orbiters just before Mercury orbit is achieved. Then, the two spacecraft will each be put in separate orbits to perform scientific investigations of Mercury. Japan's MMO will have an orbit of 9.3 hours, and Europe's MPO an orbit of about 2.3 hours. The mission is expected to last for one Earth year, which is the equivalent of four Mercury years. It may be extended for an additional Earth year if funding allows, and the two spacecraft remain in good health. So if you are tired of petty squabbles here on earth, look to the sky. At least there, there is hope for the future.